Imagine this: your opponent has all the cards they need in hand, they’ve got a bit of a head start on you in set-up, and they’re ready to keep the pain train rolling. What would you need at this point? Possibly a helpful Item? A Supporter? Maybe even an Energy? Probably not the last, but it could be good for today’s Pokemon. Purugly is a Stage 1 Colorless Pokemon, 110 HP, with a Fighting Weakness, no Resistance, and a Retreat Cost of 2. Her first attack is…Own the Place? Yeah alright. Own the Place is a 1-for-20 move that discards your opponent’s Stadium if they have one, with Purugly being immune to any attack – effect or damage-wise – from your opponent’s Pokemon. Her second attack is Toss Aside, a 3-for-60 move that forces the opponent to discard cards from their hand till they have 3. Purugly’s interesting in that she can be unusually powerful. Limiting your opponent’s options to only a few cards can be handy, and being immune to attacks while getting rid of a Stadium can be pretty powerful too. The problems I find with it though are that it’s very situational. When is your opponent going to have a Stadium you want to discard that you wouldn’t have a Stadium of your own to use to get rid of it? Granted Stadium Wars aren’t as drastic as they were in the XY era, where it felt like every deck had their own Stadium card, but I imagine that’s where moves like Own the Place come in handy. Then there’s Toss Aside, which is also remarkably situational. You’re more or less counting on your opponent to be putting cards in their discard pile that they don’t want to be there, all while keeping cards they don’t want or can’t use in their hand. And considering they keep three of them, it’s not hard to imagine that they won’t always be worried about what goes away for a while. Purugly could prove to be decent in a couple of decks, but as for whether or not she’s good outside of that, it’s hard to say. Assuming your opponent doesn’t keep or draw into a draw Supporter, Toss Aside can be good disruption on-par with Red Card and the like. And Own the Place is just annoying to deal with! Course your opponent won’t always have a Stadium to replace their last one with, but I suppose it’s worth it to keep Purugly in to counter whatever Stadium is being run the most. Side Review: Skuntank – funny enough, Skuntank has its own dodge ability of sorts, but on top of that it might be better than Purugly’s. Sticky Smokescreen does more damage than Own the Place, and it has your opponent flip coins, with the result of either of them being Tails being a failed attack. This gives your opponent only a 25% chance to hit, whereas Purugly guarantees the lock provided you discarded a Stadium. Purugly is more flexible than Skuntank, being Colorless and all, but Skuntank I would say is better in this situation. Next Time: A double-header? But even more so a strange one? Purugly (SM Ultra Prism 109/156) has some utility that can frustrate your opponent. Own the Place discards a Stadium that your opponent played (not you) and being immune during your opponent’s next turn. Toss Aside is disruptive as well, with you having control as to which random cards would be discarded until their hand size is down to three. Of course, such effects can be played around or mitigated. Own the Place may make you immune, but being switched whatsoever such as Guzma resets the effect. Toss Aside can even help your opponent if the cards that you randomly discarded turned out to be basic energy cards or even Pokémon. Notes: It’s been a long while since Glameow and Purugly has appeared in the TCG unless I’m missing an expansion or two. Purugly (UP 109) purrs its way into the meta from the Ultra Prism expansion set. This 110 HP Stage 1 Colorless Pokemon has two attacks. Unfortunately, you will rarely get to take full advantage of its single attachment attack Own the Place. This attack does only twenty damage but provides you with complete immunity to all damage and effects of attacks during your next turn… if your opponent is foolish enough to put a Stadium into play. This only happened I think twice for me, so Own the Place does perform as a pretty functional soft lock against Stadiums from your opponent. If you do use Own the Place and your opponent has a Stadium in play, you must discard that Stadium as part of the attack. The attack you will use the majority of the time is Toss Aside. This attack does sixty damage and discards random cards from your opponent’s hand until they have three cards remaining. This was a pretty devastating attack at times. You want to watch someone concede? Try hitting double heads on Rocket’s Handiwork and then play Toss Aside and throw two or three cards out of your opponent’s hand. And this deck worked really well at first. I went 4 W 1 L in my first five matches, and four of those matches were against meta decks: Glaceon Zoroark, Buzzroc, Espeon Garb, and Volc (the only loss). I was about ready to feverishly email Otaku, wondering how we could all have missed this amazingly disruptive mill deck… and then it came back down to Earth hard. I promptly proceeded to lose ten out of the next eleven matches. I couldn’t hardly get a single win out of this deck. 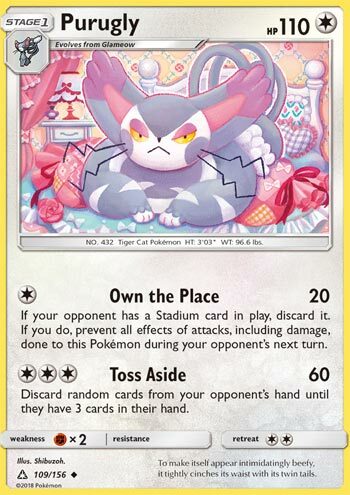 I paired Purugly with both Garbs BKP and GRI (I remember somebody telling me shortly after UP dropped that they had come across a really good Purugly Garbodor deck on PTCGO and I filed that idea away because I knew we’d probably review this fat cat at some point). My list had some hammers and Rocket’s Handiwork, but really the main idea is to do a little chip damage, throw a bunch of Items into the discard, and then let GRI Garb do its Trashalanching thing. And it worked very well at first. I really have no idea why that happens, why I’ll start out SO WELL with a deck list and then it just falls off the face of the Earth. A lot of times I wonder if it’s me, if it’s something in my mental make up, where I start to have success with a deck but then end up over analyzing it and lose the deck’s mojo. But then I think about how I’m 12 W 3 L with Buzzodor, 7 W 4 L with Greninja, 15 W 6 L with Zorovile, and then I realize that it’s probably more to do with the deck than with me. So I named this deck Smelly Cat, and you get the gold star of the day if you know what that references. It’s got some upside, I don’t know maybe it would have done better with Weavile (BUS or UP) than BKP Garb. Maybe a better pairing would be with Durant (BKP 9). If you’ve got a decent decklist for Purugly, feel free to reach out to me at PDC I’d love to hear about it.